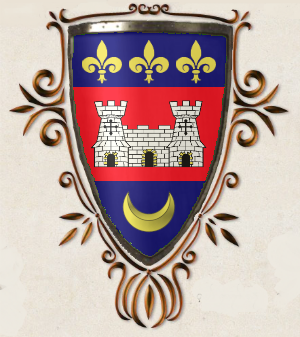 House Toluard governs Siovale’s provincial duchy and ranks second or third in prominence amongst its noble families, depending upon where one is so charitable as to place the deposed Perigeux. For the past seventy years it has enjoyed a healthy friendship with House Rocaille, the sovereigns of Siovale, bolstered by judicious intermarriages between their two clans; it boasts also a not-insignificant familial and trade alliance with the ruling family of Milazza in the Caerdicca Unitas. The duchy’s principal export is a fragrant and full-bodied red wine which rates among the most prized in Terre d’Ange and therefore in the civilised world, though the white wines from the baronnie d’Yquem are perhaps even more sought after by the connoisseurs of Elua. Its forested valleys and fertile orchards yield also quantities of fine lumber and delicious fruit, which percolates gradually eastward through less favoured regions of the south. Seventy-some years ago the former ducal house of Perigeux was charged with corruption and financial mismanagement, bringing about a sea change in the affairs of Siovale. House Rocaille was elevated to the dignity of the province’s sovereign duchy (see House Rocaille for more information); in co-operation with them House Toluard took over its present seat at Bordeaux, and it has in the time since remained a major political and economic force within Shemhazai’s province. The duchy’s burgeoning prosperity has not been untempered by internal troubles. In the 1260s, during a particularly volatile border dispute between Terre d’Ange and Euskerria, the eldest son of then-duc Jean-Hilaire Odilon de Toluard was held hostage in the Euskerrian mountains for three and a half years. At the time there was hardly any hope that the Siovalese delegation would succeed in recovering the duchy’s misplaced heir: the duc was obliged to turn to his second-eldest child, a boy who bore his own name, and to regard him as his successor. Happily, ten-year-old Enguerrand de Toluard was brought safely home in the year 1271, by a party which included Oriane Somerville de Toluard, the recent widow of his great-great-uncle the baron d’Yquem. Their adventure sowed the seeds of a legendary love affair which shaped the Toluard duchy more than, perhaps, any other factor in its history. Under her care the ducal heir recovered in body and mind, to the detriment of his younger brother’s hopes: the young lord Jean-Hilaire, who had in his most formative years imagined the duchy within his grasp, was obliged to suffice himself with the lesser title of comte de Bordeaux. After the death of duc Jean-Hilaire in the year 1281 and the succession of duc Enguerrand, the new duc ruled hand-in-hand not with the Milazza wife he’d wed in 1279, but with the consort to whom he had pledged his heart in 1280, Oriane Somerville de Toluard. Despite the seventeen-year difference in their ages his choice was a popular one among the people of Siovale: all Terre d’Ange loves a love story, and the d’Angeline consort and Somerville scion they already knew, was preferred over the foreign wife who struggled to speak the tongue of the angels and never fully assimilated to her new country. These three with lives entwined displayed to the curious world a perfect amiability, though speculation as to what was going on behind closed doors in Bordeaux increased while the duchy waited six and a half years with held breath for the birth of an heir to the duchesse Caterina. The comte de Bordeaux remained a thorn in his brother’s side, neglecting his estates during long visits to Elua, spending freely, and never missing an opportunity to undermine his fortunate elder brother’s relationships with the nobility of Siovale and the Crown itself. By 1284 the duc’s fraternal patience was exhausted. In his capacity as the head of the family he stripped his younger brother of his title and appanage, citing Jean-Hilaire’s mismanagement, peculation, and petty treason against ducal authority. He installed as comtesse de Bordeaux someone he trusted implicitly: his consort the lady Oriane, who set to work with a will to reverse the previous incumbent’s depredations and put the duchy’s principal fief back into good order. Under the leadership of duc Enguerrand de Toluard and his consort the Milazza gold pouring into their duchy went to the refurbishment of Toluard castles, the planting of new Toluard gardens (the city of Bordeaux being particularly blessed in this respect), the endowment of Toluard scholarships, and the pleasures of Toluard courtiers. The provincial court at Bordeaux became a jewel of its kind, a haunt of sporting and fun-loving nobles of Siovale and L’Agnace, forward-thinking young scholars, and any number of poets and artists, composers and sculptors. A sojourn there became de rigueur for nobles of other provinces traveling in the south. The death of duc Enguerrand de Toluard in a jousting accident on the occasion of his daughter Marie-Vivienne’s wedding in the high summer of 1309, precipitated a palace revolution. The new duc de Toluard, under the guidance of his Caerdicci mother, was quick to grasp the reins of power and make it clear that the assistance of his late father’s consort was no longer required in the day-to-day affairs of the duchy. The comtesse de Bordeaux retired to her own chateau, to grieve the loss of her love, whilst one by one her appointees in the duchy’s administration found that they too were superfluous to the new broom’s requirements. In 1310 the warrant by which Oriane Somerville de Toluard was created the comtesse de Bordeaux in 1284 was declared invalid by the new duc de Toluard on the grounds of irregularities recently come to light. The comté reverted to its previous holder, Jean-Hilaire de Toluard, along with all lands, properties, and chattels invested therein. A lawsuit challenging these dispositions has been filed by the former comtesse and her daughter and heir, the baronne d’Yquem, and remains pending before the Crown. The new and old comte de Bordeaux is understood to be offering the benefit of his experience to the duc and the dowager duchesse, and advising them on matters of policy and administration within the duchy.